“If widespread disaster befell the Earth, what would you need to know to survive? What could you learn from mankind’s accomplishments and failures? If widespread disaster befell the Earth, what would you need to know to survive? What could you learn from mankind’s accomplishments and failures? The scientist, environmentalist, and originator of the Gaia hypothesis envisioned a guide that could help survivors of a catastrophic event better understand planet Earth and how it works. 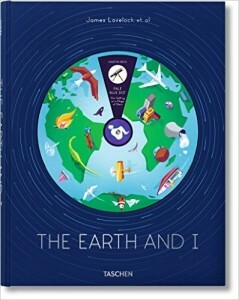 Eighteen years later, a version of that guide has materialized as The Earth and I (TASCHEN Books, 2016), a collection of essays by scientific thought leaders—including theoretical particle physicist Lisa Randall, biologist E.O. Wilson, and neuropsychiatrist Eric Kandel—and curated by Lovelock. 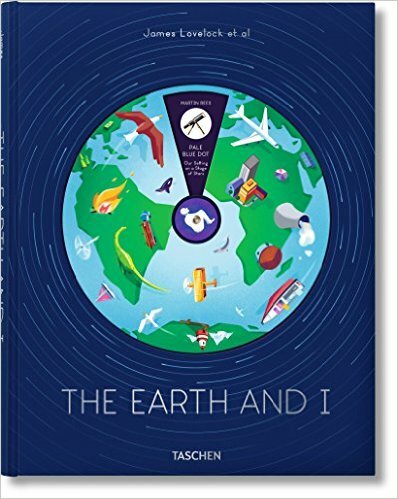 The book provides insight into the intricacies of Earth and humanity, covering everything from the planet’s geology and fossil records to how tools have evolved into today’s technology. Whimsical illustrations and infographics by British artist Jack Hudson illuminate concepts described in the text. “We are buried beneath mountains of fast accumulating data,” Lovelock writes in the introduction. “Rather than adding to the data load, this book aims to offer real understanding.” Together the essays act as a sort of primer to the Anthropocene, what some scientists consider a new geological epoch marking mankind’s profound influence on the planet. The book’s overarching theme is examining how we got to where we are, and what the future holds.